I love light suppers that include fresh vegetables and herbs! I especially like meals that I can prepare without heating up the kitchen with the oven. Recently I made a trek to Whole Foods to purchase some salmon and whipped up one of my favorite recipes using this delicacy. Holly Clegg, local and very famous cookbook author and chef, gave me permission to publish her recipe on my blog. 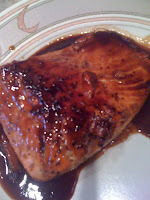 The recipe for "Glazed Salmon" is found in her book, The New Trim and Terrific cookbook. If you don't know about Holly's cookbooks, be sure to take a look at her website. You might also catch her appearing on television from time to time around the country. She has also been on nationwide networks. See what I mean? She is famous! What I particularly love about her cookbooks is that she includes nutritional information and normally uses ingredients that are easily procured. 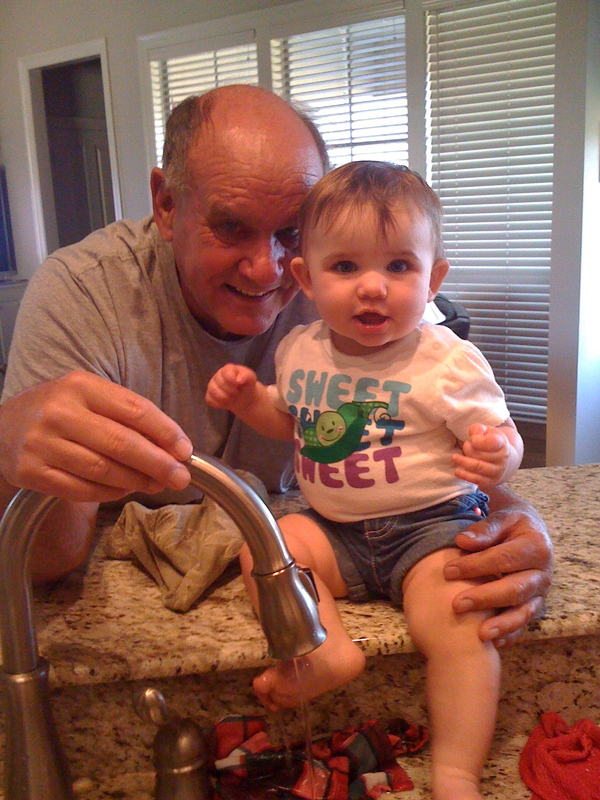 Most of the time I have most of the things needed for her concoctions in my pantry. Holly also has an app for your IPhone. It's free and is called Mobile Rush-Hour Recipes. On the app you get suggestions and shopping lists. Love this app! I have digressed.....This simple supper consisted of three menu items. We feasted on Glazed Salmon, steamed asparagus, and Caprese salad. The asparagus spears were seasoned very lightly with a touch of sea salt and some melted butter. It is almost shameful that such delicious foods can be put together in such a short amount of time and have such visual appeal as well. In a non-stick skillet coated with non-stick cooking spray, cook the salmon on each side, 3 to 5 minutes, until golden brown, crispy and just cooked through. Transfer the salmon to a platter. You will have to buy her book to get the nutritional information. She is also on Amazon! A note on the salmon: Ask the fish guy to cut your fillets in the center of the piece of salmon, so they are the same thickness. Then have him use his very sharp knife to take the skin off. If you live a long distance from Whole Foods, as I do, ask for a bag of ice to keep the fish cold as you drive home. 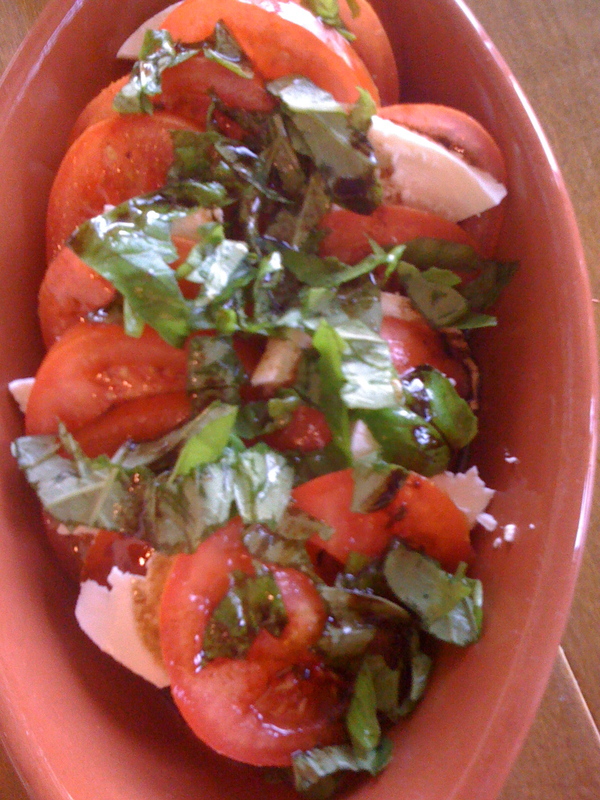 Layer the tomato and cheese slices in a serving bowl. Sprinkle with chopped basil leaves (A divine fragrance is released when the basil leaves are cut). Whisk the olive oil and vinegar together and pour over the salad. Sprinkle with black pepper. Best served at room temperature. This supper is so easy to prepare that I can even accomplish it with the help of my sous chef, Olive. 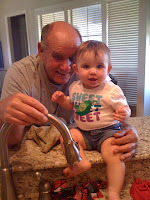 The photo proves that she and her Paw Paw are a big help in the kitchen. Enjoyed reading! Will try these! Thanks. I need to write a blog about your publications. Will do that soon! Sound great Dot. I think I'll have to put this one together one evening as a surprise for my wife. It sounds like a can't miss dish. She is a salmon lover and this one sounds right down our lane. Thanks! Blessings on the "Weekday Rambler."